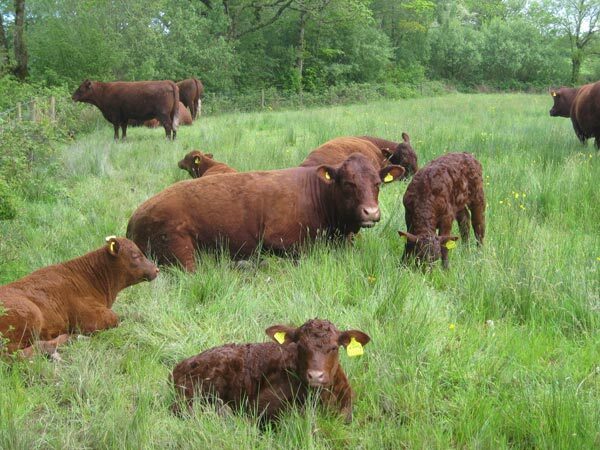 After much planning and discussion, in 2011 we finally started the South Yeo pedigree suckler herd of native Red Ruby Devon cattle. The breed are indigenous to the area, flourish on the local culm grasslands and produce spectacular marbled beef, without doubt the best we’ve ever tasted. They are also the most beautiful breed, their glorious chestnut coats changing from deep red to glowing ginger depending on sun and shade. 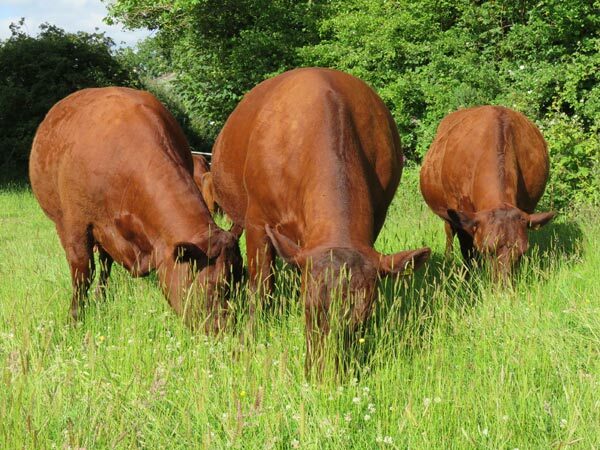 We are using the Devon Rubies as conservation grazers as part of our Countryside Stewardship commitment. Once the orchids and other culm species of wild flowers in our meadows and woodland have flowered and set seed, the cows are used to graze, ensuring that the light poaching of the purple moor-grass and rush pasture provides suitable conditions for plants to colonise in the following year, particularly for those native plant species that are less competitive and therefore vulnerable. Our heavy clay soil and generously wet Devon climate means that the cows need to be housed over the winter and regular handling of the cows whilst they are in the barn has got them used to us and us to them – we are completely smitten with the breed. All cattle are now home bred to minimise health risks and high herd health is a priority for us. We are part of the HiHealth Herdcare Cattle Health Scheme and the herd has tested negative for BVD, IBR, Leptospirosis and Johne’s over several years achieving elite health status. 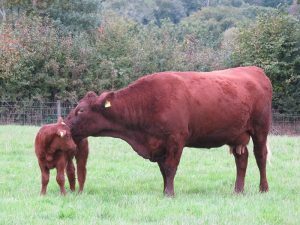 Our calves are naturally weaned by their mothers at around eleven months of age, about a month before the cow is due to have her next calf. As we don’t separate the young from the herd, it’s absolutely stress free. 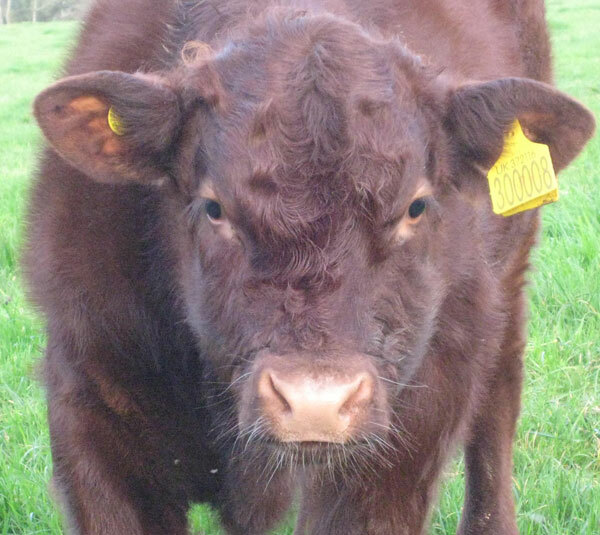 We are members of the Devon Cattle Breeders’ Society. Our gorgeous Devon Ruby beef is available in our range of home produced meat boxes. We do have pedigree stock available for sale from time to time. 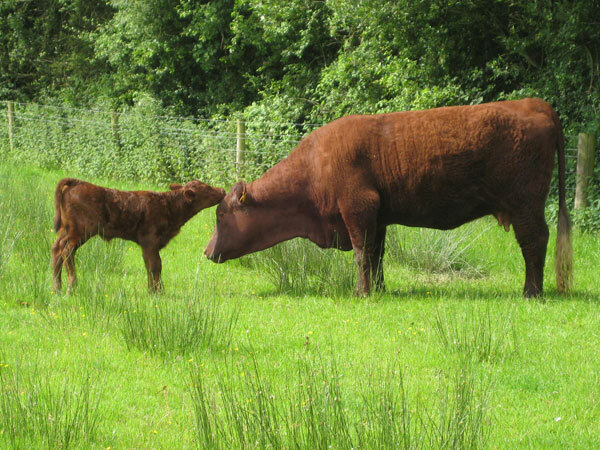 Currently we have for sale a 2014 born cow with her second calf (steer, born September 2018) at foot, pictured here. Please contact us for more details.